Transcription Trends: Medical Transcription — Is It Dead Yet? According to the Bureau of Labor Statistics, in 2016 there were approximately 57,400 medical transcriptionists or health care documentation specialists in the United States. While the Department of Labor does predict a 3% decline from 2016 through 2026, the numbers support the fact that the profession is still viable and that there will continue to be a demand for medical transcription as health care services such as medical tests and procedures grow. Nevertheless, health care providers will continue to seek cost-saving measures by eliminating in-house medical transcription and contracting with transcription services. As a result, there is a perception that medical transcription, as part of revenue cycle management, is a dying occupation. In fact, many have wondered, is it dead yet? Let’s first start by looking at the cost of EHR implementations. In a recent Becker’s Health IT & CIO Report, it was reported that Buffalo, New York–based Catholic Health is investing more than $100 million in a project to implement an Epic EHR. The project is targeted to take around 18 months. As facilities and organizations pursue these types of expensive projects, there will be a push for cost savings. In turn, there will be a plea to physicians and hospital caregivers to self-document. If these organizations have in-house transcription, they will look to transition those employees to other positions within the organization or potentially partner with a transcription vendor. As part of the negotiation with the transcription vendor, the provider will demand lower line rates and tighter turnaround times. 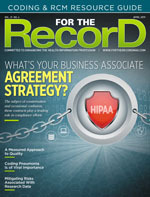 Recently, Health and Human Services announced it had collected a record-breaking $28.7 million in HIPAA settlements last year. This staggering figure illustrates the criticality of accurate clinical documentation for health care quality, patient safety, and accurate coding and billing. To make clinical documentation easier for the health care providers, the EMR industry has produced cookie-cutter templates, drop-down lists, and check boxes. Health care providers are expected to spend considerable hours learning the integrated features of an EMR which may include any or all of the previously mentioned templates, drop-down lists, and seemingly endless screens of check boxes, as well as learn how to properly dictate. Front-end speech recognition requires providers to edit/proofread their results to ensure the templated information was entered correctly and dictated text was accurately recognized. Health care providers continue to express frustration with completing these clinical documentation tasks, which are often undertaken with the patient sitting in front of them, a time when they should be focusing on capturing the patient’s story in detail so that they can refer to these notes with confidence and share the information with other health care professionals. There’s little doubt that clinical documentation has become more complex. Health care providers need a means to document more details about the patient narrative than those represented in EMR templates, drop-down lists, and check boxes. The situation is exacerbated by the transition to bundled and value-based payments. The medical transcription industry is starting to see an uptick in dictation volumes as health care providers begin to realize the woes of generating documentation themselves. Reports have emerged in which physicians express a diminished enthusiasm for their profession, noting that administrative tasks were less about patient relationships and more about coding, billing, reimbursement, and compliance. The 2016 Survey of America’s Physicians: Practice Patterns & Perspectives, which interviewed more than 17,000 physicians, found that physician job satisfaction was on the decline, with close to 50% reporting frequent or constant feelings of professional burnout. The Medscape Annual Survey 2017 indicated that 51% of physicians had frequent or constant feelings of burnout. In Medscape’s National Physician Burnout & Depression Report 2018, 56% of the physicians said documentation burdens contribute to burnout, and 24% blamed increased computerization of EHR work. It’s been estimated that one-half of a physician’s workday is spent entering data into EHRs. A recent study reported that 90% of hospitals plan to expand their use of speech recognition technology. There are two primary ways that speech recognition works in a documentation environment. In back-end speech recognition, the dictator dictates, the audio is converted to text, and a trained medical transcriptionist edits the resulting document. In the front-end speech recognition workflow, the dictator dictates directly into free-text fields and edits the transcription with no intervention necessary by the medical transcriptionist. “Analysis of Errors in Dictated Clinical Documents Assisted by Speech Recognition Software and Professional Transcriptionists,” published in JAMA Network Open, found the error rates to be 7.4% when documentation was generated by speech recognition software, 0.4% when reviewed by a trained medical transcriptionist, and 0.3% on the final version that was signed by the dictator. These findings translate to seven out of every 100 words being incorrect in a speech-recognized document. The study was representative of a random sample of 217 documents (83 office notes, 75 discharge summaries, and 59 operative reports) dictated by 144 different physicians over the period of January 1, 2016, through December 31, 2016, at health care organizations utilizing Dragon Medical 360 | eScription by Nuance. Specialty information for 121 physicians was available, with a total of 35 specialties represented (37.2% surgeons, 24.8% internists, and 38% other specialties). The fact that more than a 7% error rate occurred in documents that went through speech recognition software speaks to the importance of manual editing and review prior to posting patient data in the EMR. Poor documentation poses significant risk to patient safety and compliance. In addition, reimbursement is likely to be affected. While there have been many improvements to speech recognition software, the technology’s capability to understand odd-sounding and sound-alike words such as their/there, terms, drug names, and phrases is still limited. Also, dictators with different accents or dialects and those who mumble or dictate quickly will likely produce a report that’s in need of significant editing, whether it be by the dictator before signing the report or by a trained medical transcriptionist. The study “Error Rates in Physician Dictation: Quality Assurance and Medical Record Production,” published in the International Journal of Health Care Quality Assurance, concluded that the physician-as-editor model does not guarantee that dictation errors will be spotted. The findings note that physicians do not always take the time to edit and proofread their dictations. The majority of clinics, hospitals, and transcription service vendors that continue to utilize and employ medical transcriptionists have comprehensive quality assurance programs in place. Conversely, there is no comprehensive quality assurance program in place for speech recognition, resulting in a lack of accountability, liability, and regulatory oversight for the documentation produced in this manner. So, has medical transcription flat-lined? The reality is that speech recognition technology—alone or as part of integrated EMR systems—is here to stay. However, because speech recognition can be unreliable and requires supervision and intervention, it will not eliminate the need for skilled medical transcriptionists and health care documentation specialists. Instead, the technology changes how those skilled individuals should be best utilized, requiring them to become editors of the documentation as opposed to the traditional role of transcriptionist. Therefore, it behooves medical transcriptionists to take charge of their future and hone their editing and proofreading skills. That being the case, medical transcription will always have a place alongside speech recognition to provide alternative solutions to all health care personnel. — Karen Clay is president of transcription operations at iMedX.